When it comes to digestive health, we should keep in mind that it is directly impacted by the foods we eat and the lifestyle we live. By employing some healthy habits, our digestive system can function more efficiently, improving our overall health and sense of well-being. Eat a high-fiber diet. Consuming a diet that’s high in fiber and rich in whole grains, vegetables, legumes, and fruits can improve your digestive power. A high-fiber diet can also help you prevent or treat various digestive problems, such as diverticulosis, hemorrhoids, and irritable bowel syndrome (IBS). In addition, it can help you achieve and maintain a healthy weight. Get both insoluble and soluble fiber. It’s important to consume both types of fiber since they help your digestive process in different ways. Insoluble fiber, also known as roughage, can’t be digested by the body and, therefore, helps add bulk to the stool, while soluble fiber draws in water and can help prevent stool that is too watery. Good sources of insoluble fiber include wheat bran, vegetables, and whole grains. You can get soluble fiber from oat bran, nuts, seeds, and legumes. Limit foods that are high in fat. Because, in general, fatty foods tend to slow down the digestive process, making you more prone to constipation. Choose lean meats. Protein is an essential part of a healthy diet. But fatty cuts of meat can lead to uncomfortable digestion. When you eat meat, opt for lean meats like chicken and fish. Include probiotics into your diet. Probiotics are the same kind of healthy bacteria naturally present in your digestive tract. They help keep the body healthy by effectively combating the effects of a poor diet, antibiotics, and stress. In addition, probiotics can enhance nutrient absorption, may help break down lactose, strengthen your immune system, and possibly even help regulate bowel movement. Eat on time. Consuming your meals and snacks on a regular schedule can help keep your digestive system in optimum shape. Aim to sit down for breakfast, lunch, dinner, and snacks around the same time each day. Stay hydrated. Drinking plenty of water is good for your digestive health. Fiber pulls water into the colon to create softer, bulkier feces, allowing them to pass through more easily. Quit smoking, excessive caffeine, and alcohol. 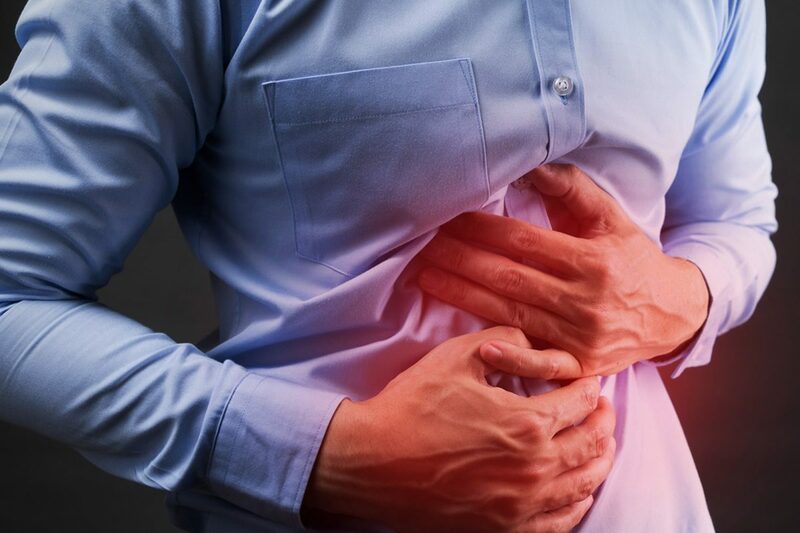 Alcoholic beverages, coffee, and cigarettes can interfere with the functioning of your digestive system and lead to problems like stomach ulcers and heartburn. Exercise regularly. Regular exercise helps keep food moving through your digestive system, reducing constipation. Exercise can also help you maintain a healthy weight, which is good for your digestive health. Manage stress. Too much stress or anxiety can make your digestive system to go into an overdrive. Indulge in stress-reducing activities that you enjoy and practice them on a regular basis.